At just 8 months old my son made the right choice for us. He chose ‘laptop’ and pushed the tablet to one side. Why? They’re better of course. It’s a video that I just have to re-post here in 2017 when we’re all getting distracted and, to be honest, bogged-down by the tablet touchscreen. We’re getting lazier and less efficient. Here I am sitting on my bum in front of a laptop and I’m doing real work rather than messing around with Candy, sending smiley faces to ‘friends’ or getting involved with digital activism. Thanks to TouchMeMobile, a German website that is covering the same beat as us here at Carrypad, I’ve got an iPad to test for a week. Before I start though I had to do this. 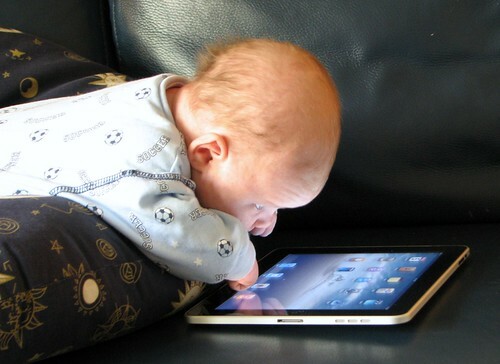 This is possibly the youngest person ever to test an iPad. 35-day old Nicklas took one look and was speechless. More from me in due course.